The identification of dwarf planet Quaoar meant the beginning of the end of Pluto’s status as a planet. Later on the much larger Eris would mark the end of Pluto’s planetary reign and Quaoar provided the assistance in this planet-killing act. 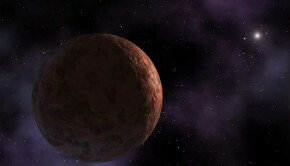 Dwarf planet Quaoar was first discovered by Chad Trujillo and Michael Brown at Caltech in June 2002. It was found using the Palomar Observatory at San Diego, California. Dwarf planet Quaoar orbits the Sun at an average distance of 43 Astronomical Units(AU). One AU is the distance between the Earth and the Sun. It takes Quaoar roughly 286 Earth-years to complete one trip around our local star. A day on the dwarf planet lasts just over 17 and a half hours. The latest estimates for dwarf planet Quaoar put its size at just under 1,100 kilometres (650 miles) in width. Quaoar, like all the Kuiper Belt objects, is an unimaginably cold world with a surface temperature of just 43 degrees Kelvin (minus 230 degrees Celsius). It is believed that the surface of Quaoar is red in colour. Its lack of reflective surface in comparison to other Kuiper Belt objects probably means that it has no fresh ice along its exterior. The dwarf planet is thought to be comprised of a mixture of rock and ice. 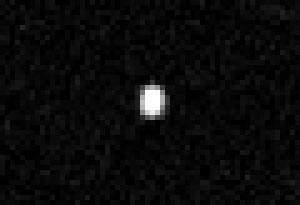 Observations indicate that it may be significantly denser than any other known Kuiper Belt object. Dwarf planet Quaoar may have cryovolcanoes which could account for the presence of crystalline ice that have been observed on its surface. If the dwarf planet does indeed have cryovolcanoes ejecting particulates of frozen matter into Space than it is probably powered by radioactive decay from deep within the interior of its core. Dwarf planet Quaoar’s name was chosen after the Tongva’s god of creation. The Tongva are a Native American people that originally populated Los Angeles, California. Quaoar’s official name is 50000 Quaoar. Like all the Kuiper Belt objects, dwarf planet Quaoar was formed from the remnants of an accretion disc that was present during the early days of the Solar System. This accretion disc was spread out over too large an area for Quaoar to coalesce into a proper planet. It has also been suggested that the high density of dwarf planet Quaoar means that it was likely hit by a large body. Such an impact is thought by planetary scientist, Erik Asphaug, to have removed an outer mantle of ice that would have made the dwarf planet up to 500 kilometres (300 miles) larger than it is presently. It has been speculated that a much larger object such as Pluto was responsible for the collision. Visit Wikipedia for more information on Quaoar.